Title: This EB suprised us @ Willow Creek Ind. Description: Q702 passes by the work site at CP Nice. Description: Eastbound CSX trash train Q702 through work zone at CP NICE on the Trenton Line. 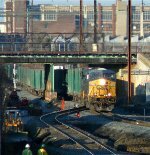 Description: A pair of GE's drag empty trasher Q702 north through the work zone at Nice on the Trenton Line at 0728. Description: Q235 is southbound at Gaithers,KY. Title: CSX 5434 leads Q409! 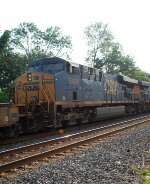 Description: CSX Q409 in Blauvelt! Description: It's 9:54 AM as eastbound CSX train Q032 with 5434 leading approaches West Van Bibber interlocking, Philadelphia Subdivision. Description: Eastbound CSX train Q032 with 5434 leading looks at an approach signal at West Van Bibber interlocking as westbound Q217 with 508 leading waits in the siding. Description: L031 speeds west towards Rossville. Description: A snow covered GEVO. Description: Flying solo in the noontime sun, CSXT 5434 hauls Q24130 south through Waltz. Description: The final CSX re-route seen, 078 books it east through Macungie with CSX ES44AH 3106 leading a pair of ES40DCs, with another Q008 re-route. Hard to believe I had just seen 3106 at Woodbourne four days earlier. Description: CSX ES44AC #3002 in the new [Box Car] livery leads CSX ES40DC #5434 with a stack train on the Lehigh line. Description: Empty intermodal wells head east through Woodbourne led by a pair of GEVOs on a rainy first day of November 2014.